The campaign teams were able to get the necessary 1,500 signatures to have this petition debated in Full Council. Well done everyone who went out in cold and rain to achieve this! The debate will take place on Weds 27 January, in the Council Chamber, Town Hall Kensington. The meeting starts at 6.30pm and the debate comes reasonably early in the meeting. PLEASE COME TO THE PUBLIC GALLERY AND SUPPORT OUR PETITIONERS AND COUNCILLORS SPEAKING ON THIS VITAL ISSUE! If you have never attended a Full Council meeting before and seen your Councillors at work trying to impose some democracy … come to the Civic Desk (follow the sparkly lights) main reception and ask for directions to the Public Gallery. Those will mobility issues will find there is level access available to the first floor, where you can sit at the back of the Council Chamber. ALL WELCOME! Kensington Labour has launched a petition to demand that the Council lobbies the Mayor of London for step-free access including lifts at tube stations. This had been agreed and budgeted by the previous Mayor Livingstone, but the current Mayor withdrew the funding. 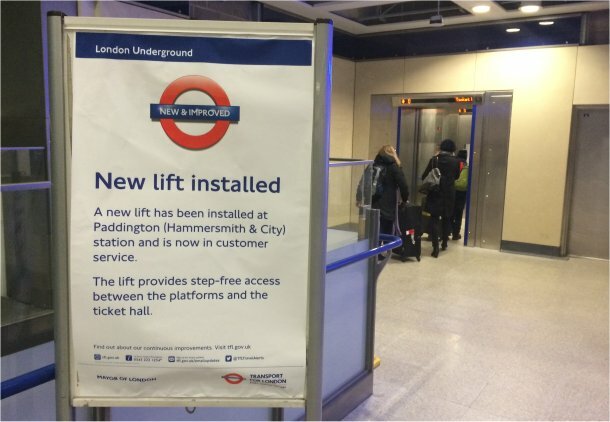 You can access Hammersmith and City line via a lift at Paddington, but you can’t get off at Westbourne Park, Ladbroke Grove or Latimer Road! We also have huge concerns at other busy stations such as Kensington High Street and South Kensington. “I advised the trust Chair and Chief Executive to attend the W23 Tabernacle public meeting saying they should not operate in a vacuum without the input of local people and without giving people the right to ask questions, scrutinise their actions, and to suggest what strategies the trust should follow for the future. Unfortunately, they decided not to attend because they are locked into the belief that local people should be commenting on and suggesting improvements to the trust’s proposals and strategies, rather than accepting that local people do not support what they are doing and have a completely different vision for their area. So any kind of strongly-voiced opposition to what is being proposed is experienced as unpalatable by trust directors who say they shouldn’t have to put up with abuse when they are at work. This disconnect with the community is a historical problem born from the hijacking of the trust by Kensington & Chelsea Council from its inception and used as a vehicle to advance Council regeneration policies and to prevent real community representatives and groups, who were always branded as trouble-makers, from managing their own assets and making decisions beneficial to their communities. For several decades, the trust has been run as if it were a castle bordered by a mote and peopled by the Council’s grandees who have ingrained their philosophy of neo liberal top down decision-making on the organisation which is a hard mould to break. The trust now has less Community representatives and elected Councillors, and more professional appointees on its board than it had a year ago. It was set up to go down the corporate route and that process will continue unless the local community backs up its wish for an alternative vision with real actions”. The RBKC Labour Group of Councillors has been elected to represent residents who live around the Westway, and whose lives and livelihoods are affected by the presence of the road that sliced through their neighbourhood in 1970. The demolition of homes, the dislocating effect of the flyover on travel options, the pollution, and the use of space beneath the flyover – originally never planned for – has had many negative consequences. The Westway Trust was set up to compensate for and to address these consequences. Regarding early plans for regenerating the 23 acres of land in the Trust’s care, the Labour Group believes the Trust must always remember its aims and responsibilities. We are concerned that the Trust’s aim of generating as much income as possible to pay for charitable works could paradoxically have a very negative effect on the communities the Trust exists to serve; some are already being forced out by rent rises and changes in policy. Some would go so far as to say that unless great care is taken the proposal for high-end independent shops, art galleries, restaurants and private housing would not help to build more solid foundations to support local business, employment and well-being, but instead would annihilate the local community. We would support a more modest set of proposals that would put local needs first. We consider that the Westway Trust began this process poorly but welcome signs that it is now beginning to learn from the responses from the community and from Councillors’ comments that there is a better way. We are pleased that the Trust has agreed to reconsider its previous timetable and plans and note that they have improved the consultation period. We look forward to working with the Trust to ensure that any redevelopment by the Trust of the area that we are elected to represent maximises the interests of residents, traders and visitors and is not dominated disproportionately by the wish to generate revenue. Prepare a set of guidelines for any future planning application, to include policies from the SPD, Local Plan, The London Plan and national planning regulations. The RBKC Labour Group of Councillors would like to clarify their position on the location of a possible Chelsea Crossrail 2 station at Dovehouse Green and the Chelsea Fire Station site. The purpose of a Crossrail station at this location is to improve transport connections for that part of Chelsea, and the Labour Group agrees that this is essential for the ongoing success of the area and its residents. Given that Dovehouse Green and the fire station have been designated and safeguarded for many years, after discussion we have concluded that this is the best location for a Crossrail 2 station in Chelsea. However this proposal should not be to the detriment of local fire services, and the Labour Group of Councillors would like to view plans for its relocation in the borough. The RBKC Labour Group of Councillors would like to clarify their position on the demolition and redevelopment of the Marlborough Primary School building and site, which is owned by the Council. When the planning application for the demolition and redevelopment of the School building and site came to committee in 2013, Labour members of the Planning committee were unconvinced of the necessity to undertake such drastic measures to enable improved services, and they voted against the application. When the Key Decision relating to the sale and land-swap between Marlborough School and the John Lewis Clearings site came to Cabinet and Corporate Services Scrutiny Committee in 2014, Labour members along with some Conservative members, questioned the integrity of the deal and how it would work in practice. We are aware of the debate about the potential listing of the building and of accusations relating to John Lewis. As a Group we are sensitive to the debate about our architectural heritage; we also accept that the Council is under pressure to provide new services and ways to provide them. Whether or not these two imperatives are mutually exclusive must be decided on the merits of each case. It is a shame that local Brompton and Hans Town ward Councillors have not been supportive of the campaign to save the existing school building, and if indeed the campaign represents the wishes of a majority, it would be their duty to do so and a failure on their part. Our current view is that had they intervened earlier, a more satisfactory outcome may have been achieved.